Porto Cervo, Italy (27 September) - Congratulations to the very first Melges 32 World Champion, American Pieter Taselaar on USA-169 Bliksem with Jeremy Wilmot on tactics and crew of Nathan Wilmot, Williem Van Waay, George Peet, Paul Atikins, Michael Coxon and Alex Clegg. 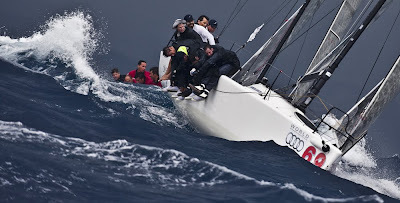 This amazing team has come a long way since the 2009 Miami Grand Prix, Audi Sailing Series Events in Scarlino and Cagliari, only to arrive in Porto Cervo and win the World Championship. In second and third overall is Giovanni Maspero on ITA-999 Joe Fly and Armando Guilietti helming ITA-1 Uka Uka Racing for Lorenzo Santini tied with equal points. Originally leading the event, Claudio Recchi on ITA-93 Team 93 had a tough last couple days in the competitive arena leaving him in fourth overall. Although disappointment ran deep last evening following a major protest from Taselaar against Claudio Recchi on ITA-93 Team 93, in which Taselaar won, there was still a heated battle for the second place overall position. Recchi, in second by one point over Guilietti, both went into the day's one and only race, putting spectators on the edge of their seats for the start. The light and shifty air tested the fleet, mixing up the rounding with Wolfgang Stoltz on GER-205 Opus One in first, Maspero, then Edoardo Lupi on ITA-487 Torpyone. Maspero dialed the race in to round the final mark in first, Stolz now in second and in third, Luigi Melegari on ITA-161 Matrix. Maspero blasted downwind for the win, Melegari took second and in third, Stolz. The Bliksem team did not sail today. Instead they celebrated honors last night at Yacht Club Costa Smeralda that held a fabulously lavish buffet dinner and party in honor of the event. The International Melges 32 Class Association (IM32CA) would like to extend a sincere gesture of gratitude to all competitors that traveled from around the world to compete in Porto Cervo. Without your presence, support and enthusiasm for the Melges 32, this World Championship would not have been a great success. 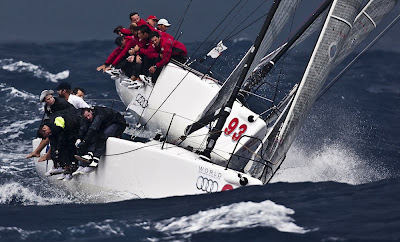 A very special thanks to title sponsor Audi who has not only supported the Melges 32 throughout the year, but also the Worlds. The IM32CA looks forward to this continued partnership in 2010. The Class would like to specifically recognize Stuart Simpson on GBR-84845 Team Barbarians for his help and assistance with the acquisition of the World Championship Trophy. The prize, an Elkington Bowl dating back to 1895 graciously wears the Melges 32 World Champion engraving upon a mahogany plinth. Stuart — you are a treasure to the class, your passion and love for the Melges 32, truly immeasureable. A very special thank you to Filippo Pacinotti, European Melges 32 Fleet President. His leadership, dedication, tireless efforts and hard work have been phenomenal. Many thanks to Yacht Club Costa Smeralda, most especially Edoardo Recchi and staff. Their constant support and professionalism has been amazing. The IM32CA is most appreciative of the careful hand and guidance of PRO Peter Reggio and committee, they have exceeded expectations. A special thanks to Melges Europe with the support of Melges Performance Sailboats in the USA — in particular Federico Michetti, Harry Melges, Andy Burdick, Charlie Harrett, Luisa Bambozzi and Paola Spreafico. 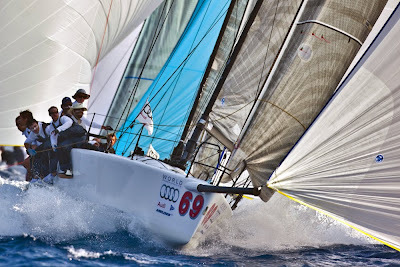 The Melges 32 in 2009 is not finished yet, in fact, it's just getting started. Join the fleet in Ft. Lauderdale, Fla. at the Lauderdale Yacht Club on December 4-6 for the start of the 2010 Winter Series with the Gold Cup Regatta. Mark your calendars for the 2010 World Championship taking place in San Francisco, Calif. on September 22-25, hosted by the St. Francis Yacht Club. Just prior, plan to also attend the Rolex Big Boat Series on September 15-19. This event will serve as a Pre-Worlds. 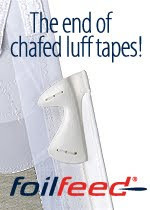 Stay tuned to melges32.com. The Melges 32 is in high demand and due to its immense popularity, the class would like to encourage all owners interested in chartering their boats in the USA as well as Europe to post availability on the class site, melges32.com as soon as possible. Currently the class has been bombarded with charter requests for the upcoming Gold Cup Regatta, 2010 Key West Race Week on January 18-22 and Miami Grand Prix on March 4-7. 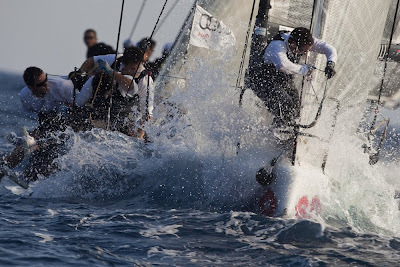 Most especially, charters are needed for the 2010 World Championship. For all new boat information, please contact the Melges company closest to you: Melges USA - Andy Burdick Harry Melges at +1 (262) 275-1110, or Melges Europe - Federico Michetti at +39 02 94435078.